The subtitle for this chapter/picture book is “A Safety Guide for Scaredies.” If you’re familiar with Scaredy Squirrel (and if you have a young child, you SHOULD be), you’ll remember that Scaredy Squirrel is scared of EVERYTHING. Loud noises, surprises, germs. So, naturally, Halloween is TERRIFYING for him. He has put together this handy guide to surviving Halloween; he offers tips on safe trick-or-treating, non-scary costume ideas, a field guide to monsters, and more. 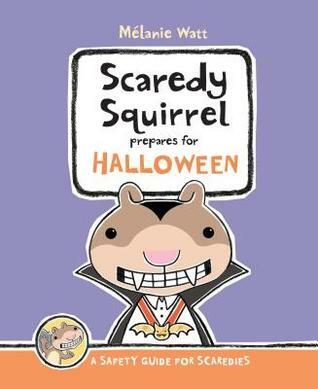 The child who is apprehensive about Halloween will adore this tongue-in-cheek guide, and the parent who is apprehensive about Halloween will appreciate Scaredy Squirrel’s rules that include having an adult check all candy before eating any. Lilah’s comments: Scaredy Squirrel is hilarious. This is a funny guide to Halloween, but he also has some really smart ideas! Like being careful when you cross the street and not using an ax to carve your pumpkin. Mom’s comments: I think this is a great book to read to nervous children who aren’t sure what to expect with Halloween approaching. My almost-seven-year-old is on the young side for this one, but she still enjoyed it. When she was 3 or 4, it would have been perfect, since she’s a bit of a scaredy squirrel herself. Scaredy Squirrel is loads of fun in his more traditional picture books, and he’s fun in this “chapter” how-to guide as well. Lilah and I both enjoyed reading it; I just think that it could be a godsend for parents of younger, nervous children, as well as being fun and entertaining.